Today we’re adding one of the most requested features in Messenger to two new countries by introducing peer-to-peer payments to people in the UK and France. It’s a convenient and secure way to send and receive money right in Messenger threads — making it fast to send money to friends without leaving a conversation. We’ve also added an animation of falling Euros and British Pounds, depending on the country, just for a touch of fun. This is the first time Messenger has extended p2p payments since launching in the US in 2015, and since then, p2p payments in Messenger have been widely used to make life more seamless. Some recent Messenger research has shown it’s not just the transactional act of paying someone back, it’s the emotional importance of doing so. Reciprocity fosters happiness and builds trust. We’ve heard that people often want better ways to express themselves when sending money, like adding accompanying text, emoticons, pictures and GIFs; of course Messenger is the best place to do many of these things, so we hope we’re bringing even more functionality to the art of conversation. We asked people in France and the UK when they wished they could send money to someone in the moment. The top reasons for sending money include celebrations, social events and festive occasions. It’s those everyday moments we’re trying to make a little easier. We’ve seen that in the US, most people use payments in Messenger to send less than $50 at a time, and sending money in Messenger has become a part of everyday life for many. 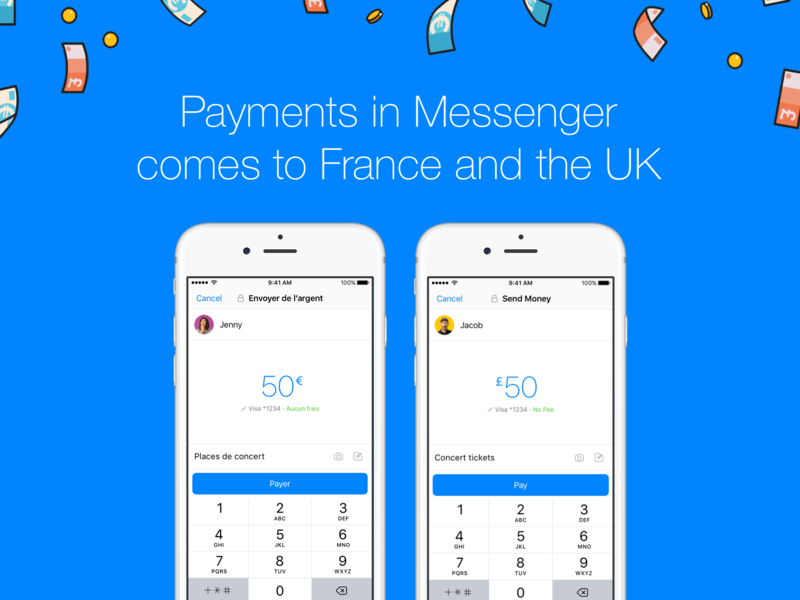 Payments in Messenger will roll out to everyone in the UK and France over the coming weeks. With this feature, people will be able to send money to others in their country (from a person in the UK to another person in the UK, for example) but not across borders. Payments in Messenger are fast, free and secure. The money you send is transferred right away. It may take one to three business days to make the money available to the recipient depending on their bank, just as it does with other deposits. Messenger uses people’s authentic identities so you know who you’re talking to. And when it comes to payments, we take extra steps for your protection: all debit card credentials are encrypted and protected with bank level security, our world-class anti-fraud specialists monitor payments, and in the rare case that we find unauthorized activity on your account, we’ll work with you to secure your account again. Plus, since payments in Messenger use debit cards, as with any other debit card payment, if you see unauthorized charges, you have recourse with your bank. Finally, Messenger payments are offered as a regulated payment service, meaning they’re directly subject to consumer protection requirements. We’re also rolling out M suggestions for payments in the UK and France. M is your helpful assistant in Messenger, powered by artificial intelligence. M offers suggestions by popping into an open conversation to suggest relevant content and capabilities to enrich the way people communicate and get things done. M, which is completely automated, will recognize when people are discussing payments and gives them the option of easily sending or requesting money. While M became available to people in the UK in August, today is M’s French debut. In addition to payments, starting today M will suggest sending stickers, sharing your location, starting a poll (in a group conversation) or sending birthday wishes.